Come rain, come shine! Magical party at the mountain. Mt. Teine is located in the 15 kilometers northwest of Sapporo’s downtown. 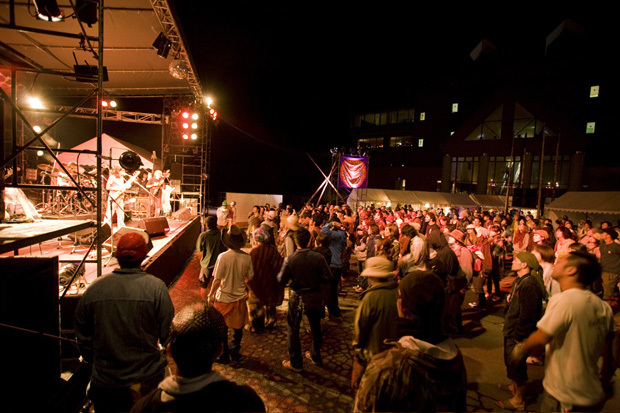 This year again, music lovers around Sapporo and beyond gathered to Magical Camp 2008, a 2-day music festival held in Mt. Teine from August 30th to 31st, to celebrate the last minute of the short summer’s end in Hokkaido. 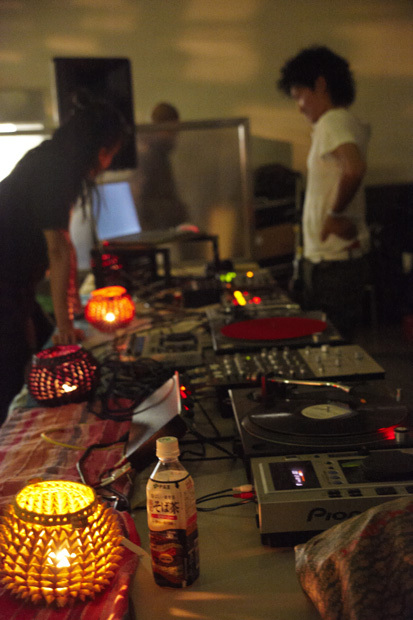 As same as the last year, the party was held at Sapporo Teine, located in Mt. Teine where in winter it gets snow covered and many skiers enjoy skiing. 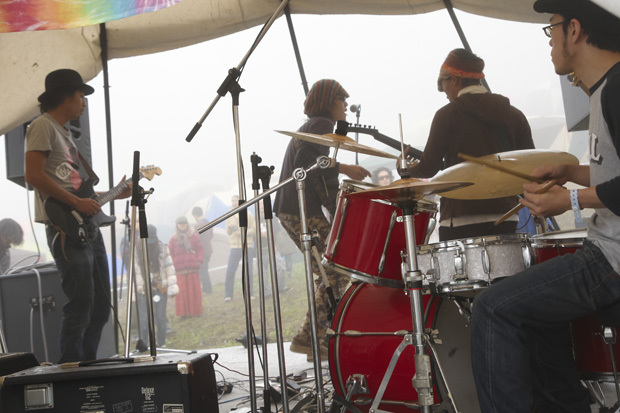 But on the day of Magical Camp the party has get started under thick clouds covered sky with many of music aficionados. I have witnessed the vagaries of weather of the mountain. As deep fog blocking your view completely, and all the sudden the fog gets cleared to show the views in front of you clearly. Foggy and sunny time and again. Drifting in the air around the site, white mist is a stage effect to enliven the party that seems like a gift from nature. 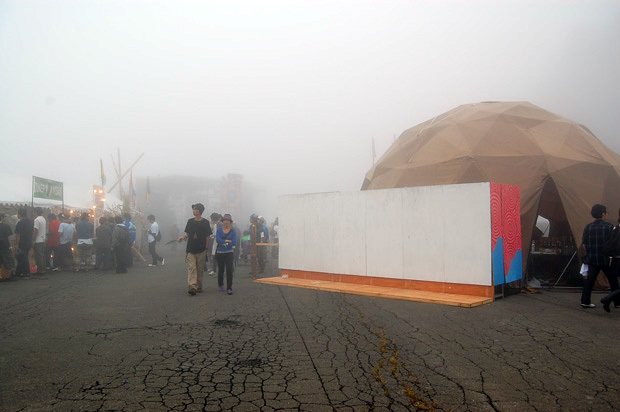 The event organizer, Tetsuya Kino says smiling “fan it with 5000 people to make a great effect of the smoky fog. It will last for a week long for sure”. By the magic of his words, the dense fog takes an important roll in the party as a visual effect. This year there are 3 stages set in different themes for each. The main stage is “Come rain, come shine stage”. 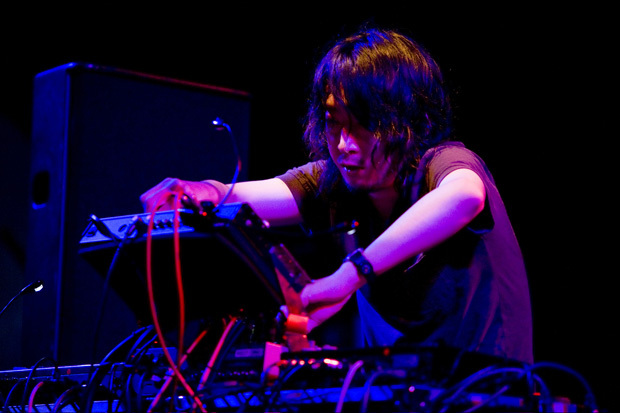 Started with Smoulfish, each one of artists from Sapporo and the world takes audience on the journey to their own world. 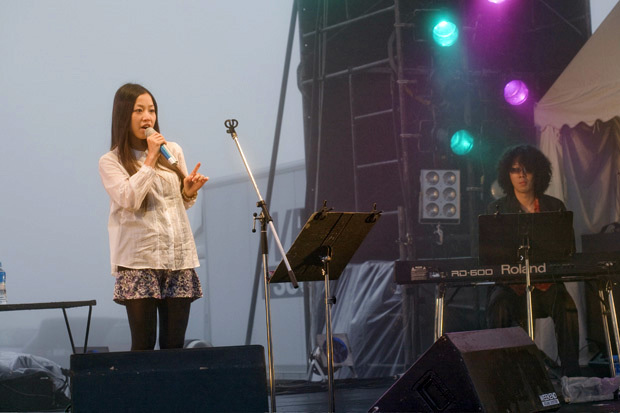 In the morning on the second day, one it showed a blue sky, but again the stage was folded in early-morning mist with clear voices of Hitomitoi, which together has created a fantastical atmosphere. And eventually blue sky and warm sun breaking through the clouds during Calm’s play around 8 in the morning. Come rain, come shine. Indeed. 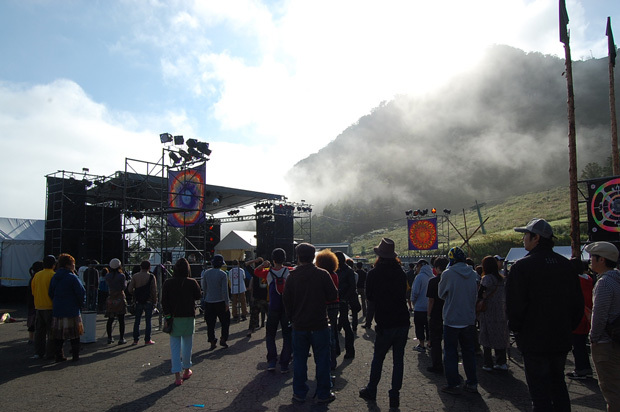 As welcomed sun, clouds, fogs and all, the main stage featured various faces and Hiroshi Watanabe & Keiichi Sokabe played to end the party. Facing to the main stage, there is a rest house where you can go upstairs to the door at the left hand. The space is originally cafeteria for skiers to relax. It is a stage, Magical Party Box, which is a fun indoor box, as its name suggests, to enjoy non-stop 28 DJ plays. 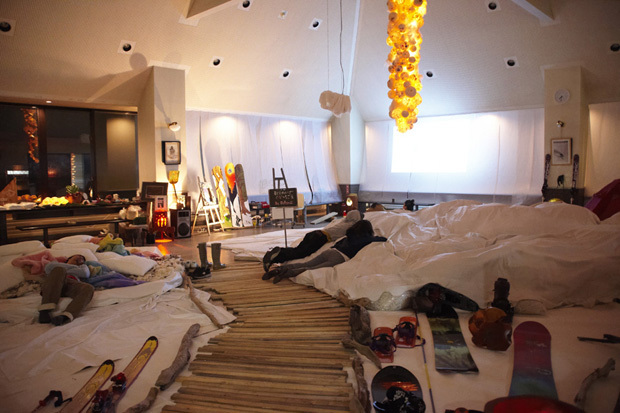 In the opposite side across the entrance, there is “Snow Lounge”, where is a chillout space imparting a sense of “Snow” and also screened a movie with a theme “No More Hot”. Filled with snow mountain look cushions made with shredded paper and woolen lamps, Snow Lounge created a soft and warm fluffiness into the space. Leaving the rest house building, you see a brand new stage from this year, “Mt. Garden Stage” where is nestled diminutively in the midst of the tent site. Mt. Garden Stage is for campers only. 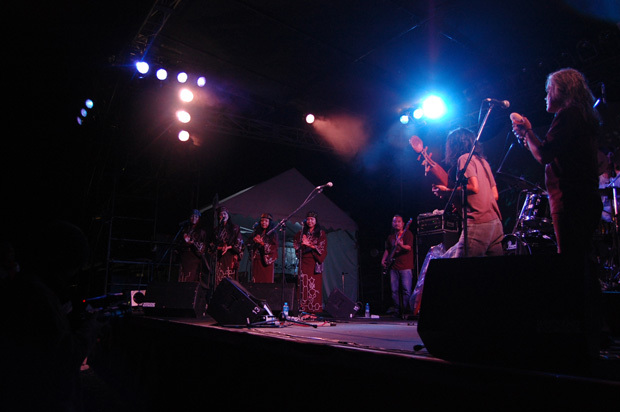 The white tipi showcased mainly musicians based in Hokkaido and various genres of music. Besides the illumination to light up the tipi stage at night, there are several lanterns flickering put like a guidepost. It seemed that the play sound I hear from the tipi to be drawn into darkness. As I looked up at the night sky, there were a lot of stars glittered in, as I could expect of the weather in the next day. There were not only works to enjoy by artists of music but also artists of art. Art works and performances were shown in here and there, all around the area at the site. 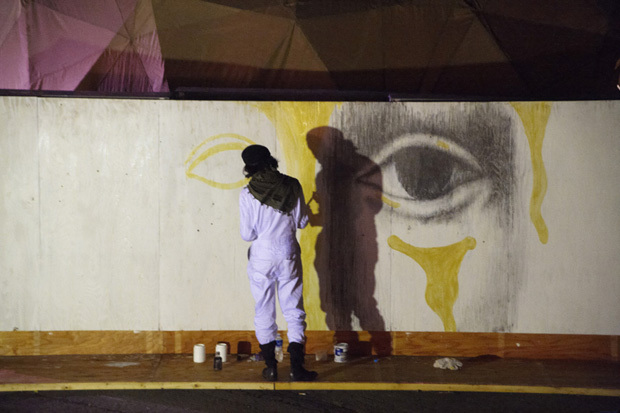 One of them is the live painting, which has performed on 3 big campus; 2 on both sides of Come rain, come shine stage and 1 in the back of the drink booth dorm tent. They are the artists based in Hokkaido and are going to exhibit their shows for the upcoming art festival “FIX MIX MAX!” which will be held in November. On the second day it was clear sunny day with blue skies up above in the central Sapporo. In the Mt. 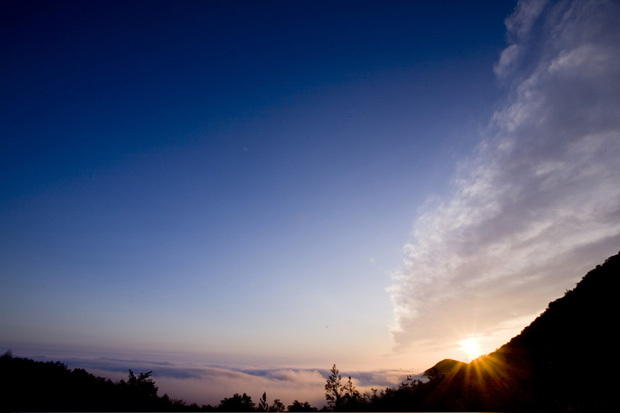 Teine, it was still the same that suddenly enveloped in fog, but the thick clouds has gone somewhere and the sun was shining though and people there were also shining brightly. A lot of dragonflies flying comfortably. The magical summer is done in a moment. Magical Camp gave us 2 days of incredible pure magic for the last summer of 2008. Check out magical girls photos at “GIRLS SNAP“. ISSO, RYU, JUN-GOLD, TACKLES-4D, DUNDEE-D, hiroki onodera, SPIRITUAL SESSION, DAINU, KEI, MOCO, MAO-FU, OHTA, LOVE LIGHT, Y to the ONE, ODA, Kinji Nishimura, HAZY-dgtl, Oono Sensei, RYOZY, HIROYA, NICKY, GONG, MACHIDA, MEGURO as BLACKEYE, birdcage, gak, “ut”Yuhhei Takeya, other. ONE DODY, JERRY”KOJI”CHESTNUTS, Tremolos,KAMUI, Jealous Guy, Takaaki Suzuki, Wedgesoul, olololop, LUNA,Oiseau, OSAMU, Oro Caldo, S.P.E.Z.O., BREEZIN’, Son&JINTANA, Chinohate, GREEN APPLE QUICK STEP, other.